issued effective April 1, 2018. The following information should help you in preparation before applying for your marriage license. WHERE TO APPLY: Wisconsin residents must apply in the County Clerk’s office in which one or both have resided for at least 30 days prior to the date of application. The marriage may then be performed in any county in Wisconsin. If the bride and groom are from different counties, the marriage license may be obtained in either county. If both applicants are out-of-state residents, the license must be issued in the county where the ceremony will be performed. 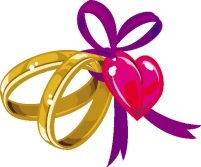 APPLICATIONS TAKEN: Marriage license applications are taken in the County Clerk’s office, Monday through Friday, from 8:00 a.m. to 4:00 p.m. Both the bride and groom must be present to apply for the license. The office is open over the noon hour. The Administration Building is closed on Saturday, Sunday and legal holidays. MARRIAGEABLE AGE: Any person who has attained the age of 18 years may marry. If a person is between the ages of 16 years and 18 years the license will only be issued with the written consent of the parents, guardian or custodian. Consent forms are available at the County Clerk’s office and must be signed by both parents or guardians in front of a notary public or the County Clerk. WAITING PERIOD: Applications must be made at least 5 FULL days before a license is issued. The 5 day waiting period begins after the date of application and ends on the 6th day, which is also the issuance day. Keep in mind that licenses are not issued on weekends or holidays. The ceremony may take place on the date the license is issued or any time within the 30 days thereafter. The 5 day waiting period may be waived upon prior approval of the County Clerk for an additional $10 fee. DATE AND LOCATION OF MARRIAGE: Applicants should be prepared to provide the date of the marriage and the correct spelling of the officiant’s name and address. The applicants should also know the municipality (city, village or township) and the county in which the ceremony will take place. MARRIAGE LICENSE FEE: $75 – Cash or check only. REQUIREMENTS: Any documents not in English must be translated by either an official professional translator or by a third party. A form is available from the County Clerk’s office. Applicants must present a certified copy of their birth certificate. A certified birth certificate must bear the official embossed seal. We cannot accept photocopies, certificates issued by hospitals or baptismal records. Copies of judgment of divorce and legal annulment papers from the last previous marriage must be presented. It is not lawful for any person, who is or has been a party to an action for divorce in any court in this state, or elsewhere to marry again until 6 months after the judgment of divorce is granted. A signed death certificate must be presented if your last previous marriage was terminated by death. Proof of residence must be provided. Your residence for marriage license purposes is where you physically lived for the past 30 days. A current driver’s license with a current address is the best proof. If this is not available, each applicant must provide 2 proofs of residency. CEREMONY: Any ordained clergyman of any religious denomination or society, licentiate of a denominational body, family court commissioner, court commissioner may perform the ceremony. The two parties themselves in accordance with the customs, rules and regulations or any religious society, denomination or sect to which either party belong. Any officiating person must be at least 18 years of age. Neither our office nor the State Vital Records Office is able to confirm the legality of a religious officiant. The marriage must be performed in the presence of two (2) competent adult witnesses (18 years or over) other than the officiating person. WHO MAY NOT MARRY: No marriage shall be contracted between persons who are nearer of kin than 2nd cousins (except where the female is 55 years of age or older, or where either party, at the time of application for a marriage license submits an affidavit signed by a physician that either party is permanently sterile. A certified copy of a birth certificate accompanied by a photo ID. A current un-expired driver's license or ID will usually serve as proof of residency. If a current driver's license or if a photo ID card has not been updated with the current address, other documents such as a current utility bill or government notification addressed to the applicant can be used. Photocopies of a certified vital record are not allowed. According to State Statutes 770.07 no County Clerk may issue a declaration of domestic partnership to individuals who apply after April 1, 2018. A. General instructions on completing and filing the notice of termination and the certificate of termination of Domestic Partnership. ​ A domestic partnership, so far as its validity is concerned, is a civil contract, to which the consent of the parties capable in law of contracting is essential and which creates the legal status of domestic partners (Chapter 770, Wis. Stats.).  Partners who want to terminate the domestic partnership must complete and file the notice of termination. If only one of the partners signs the notice of termination, the filing partner must also provide an affidavit attesting that the filer properly notified his or her partner of his or her intent to terminate the domestic partnership or that the partner made a good-faith effort to find and notify his or her partner of his or her intent to terminate the domestic partnership.  Blank notice of termination of domestic partnership forms and blank affidavits of notification of intent to terminate a domestic partnership are available at the County Clerk’s Office. There is no charge for the blank forms.  The law does not require the partners to file a certificate of termination of domestic partnership if the partnership ended due to the marriage of one of the partners while the partnership was in effect. In such a case, the domestic partnership is automatically terminated on the date of the marriage. However, the termination documents have been designed to allow the partner(s) to file the domestic partnership termination documents if they want to do so.  There is a fee for processing the notice and issuing the certificate of termination of domestic partnership.  There is no expiration date for filing the certificate of termination once it is completed and issued by the County Clerk. However, it has no legal value until it is filed at the appropriate Register of Deeds Office. B. Vital Records Filing Requirements.  It is illegal for a filer to make a correction on a certificate of termination of domestic partnership.  If a certificate of termination of domestic partnership contains unauthorized corrections (including cross-outs, write-overs, correction fluid or tape), the record will be unacceptable for filing and a new certificate of termination will be required. In that case, the termination of the partnership will not be effective until 90 days from the date the person files a new, acceptable record at the Register of Deeds Office.  If the filer notices an error on the certificate of termination before he or she files the record in the Register of Deeds Office, the filer should return to the County Clerk’s Office to have a corrected certificate of termination issued. C. Filing Instructions and Effective Date for the Declaration of Domestic Partnership.  It is the partner’s responsibility to file the certificate of termination at the Register of Deeds Office in the same county that issued the certificate of termination.  The effective date of the termination of the domestic partnership is 90 days from the date the Register of Deeds files the certificate of termination. This is the date in the lower right-hand corner of the filed certificate of termination. Neither of the partners may enter a new domestic partnership until the 90 days has elapsed from the date of filing in the Register of Deeds Office.  You cannot use the un-filed certificate of termination for legal purposes. You may purchase certified copies of the certificate of termination from the Register of Deeds where you filed the certificate of termination and from the State Vital Records Office. You must use a certified copy of the documents for legal proof of the termination of the partnership. D. Warnings on Un-filed Declaration of Domestic Partnership Documents.  There is no expiration date between the date of issuance of the certificate of termination and the date the parties must file the certificate of termination. However, the termination of the partnership does not take effect until 90 days from the date the certificate of termination is properly filed at the Register of Deeds Office.  Since there is no expiration date. If the parties decide not to follow through with filing the certificate of termination, it is highly recommended that the parties consider shredding the document to make sure it is not filed by mistake or without the consent of one of the parties.  There are no provisions for “revoking” a certificate of termination of domestic partnership once it is filed at the Register of Deeds Office. Once the signed document is filed (even if in error), the parties will need to wait 90 days from the filing of the certificate of termination of domestic partnership and then apply for and file a new declaration of domestic partnership to activate their domestic partnership.